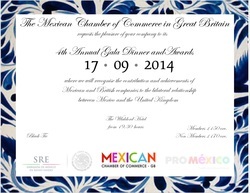 The Mexican Chamber of Commerce in Great Britain requests the pleasure of your company to its 4th Annual Gala Dinner, where we will recognise the contribution and achievements of Mexican and British companies to the bilateral relationship between both countries. During the Gala Dinner you will be regaled by a special key note speech from Luis Robles Chairman of the Board of Directors of BBVA Mexico and you will have the opportunity to enjoy of our unique art gallery sponsored by Monex. This is a superb night of fine dinning and networking opportunities which is not to be missed! Members of the MexCC please contact Maru Solis at marusolis@mexcc.co.uk to get a discount code!